Get ready to revolutionize your practice with Clinical Contact’s cutting edge technology for text, voice and email marketing. With Clinical Contact, anyone with an Internet connection can take advantage of the power of text messaging (SMS), picture messaging (MMS), voice broadcasting, email marketing and social marketing including Facebook, Twitter, to reach an unlimited number of patients! All you need is an ordinary computer with access to the Internet and nothing more. In today’s fast-paced world, patients are more on-the-go and better connected than ever before. The best way to engage these patients in real-time interaction is via their mobile phones! Expensive and increasingly inefficient direct mails, catalogs and print ads are being replaced by mobile messaging and the mobile web. Mobile text messaging has emerged as a new way of contacting patients with unmatched speed and precision. From SMS alerts and promotional messages to mobile coupons and text-to-win campaigns, Clinical Contact makes it easy to build, launch, manage, and analyze mobile campaigns in real-time. You just need to have an internet connection to access our web-based, self-serve platform and there is no need to install any additional software. Unlike SMS marketing, Trumpia MMS Mobile Marketing delivers animated images, a sound track as well as audio ensuring your brand identity is immediately recognized by your clients and prospects. Getting the contact information of patients who are interested in your services should be a top priority for your practice. Once you have your own dedicated mobile keyword, use it to attract more patients and prospects to your clinic. External Signs at conventions, expos, etc. 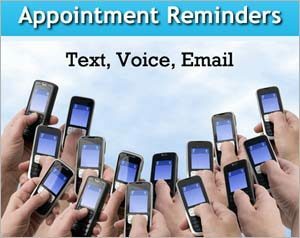 Since the health of your practice depends upon appointments and patient compliance, mobile text reminders can reduce missed appointments and increase revenue. This is the most effective way to keep your patient schedule full at all times. This feature alone will pay for the cost of your membership. 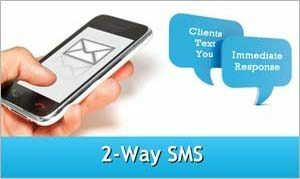 Clinical Contact’s easy to use text messaging reminder feature allows you to easily queue and send automated appointment reminders via SMS. Your patients will appreciate a text message (instead of a phone call) as a non-intrusive reminder, boosting patient compliance. It’s perfect for physical therapists, chiropractors, dentists, doctors and massage therapists. Here’s the best part – we give you done-for-you scripts to simply plug-and-play with your Clinical Contact account. and is the most effective (and least expensive way) for you to maintain a full patient schedule. reminders in minutes. All you need is a computer with Internet access! repetitive reminder phone calls and never to bother your patients with intrusive phone calls again! 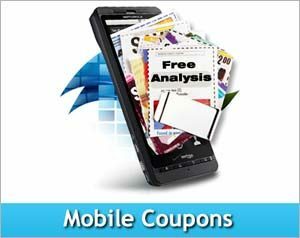 Mobile Coupons represent the most cutting edge method to send exclusive coupons, discounts and special offers directly to your patients’ cell phones! Your patients now need to rush to your clinic and simply show their cell phones to redeem their coupons. With our “done-for-you” swipe and deploy Mobile Coupons, you can create a promotional campaign, broadcast it, and start seeing an immediate increase in patient visits within minutes. Maximize gains from your marketing dollars with the speed and convenience of mobile coupons. You can now offer incentives like educational resources, discounts / special offers for services and appointment reminders. You can also create unique promotion codes for each individual SMS mobile coupon and track redemption rates and revenue generated. This allows you to precisely track which coupons worked and which didn’t. Now, you can constantly test, tweak and improve the offers presented to your patients. Generate more patient visits IMMEDIATELY since 95% of text messages are read within 5 minutes of receipt. 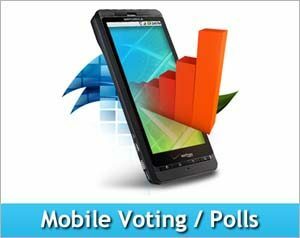 Clinical Contact’s mobile voting and survey capability enables you to create SMS polls and surveys to engage your patients. This feature gives you valuable, real-time insight about your practice. As people participate, every vote is categorized, tallied and reflected in your dashboard for you to analyze in real time. 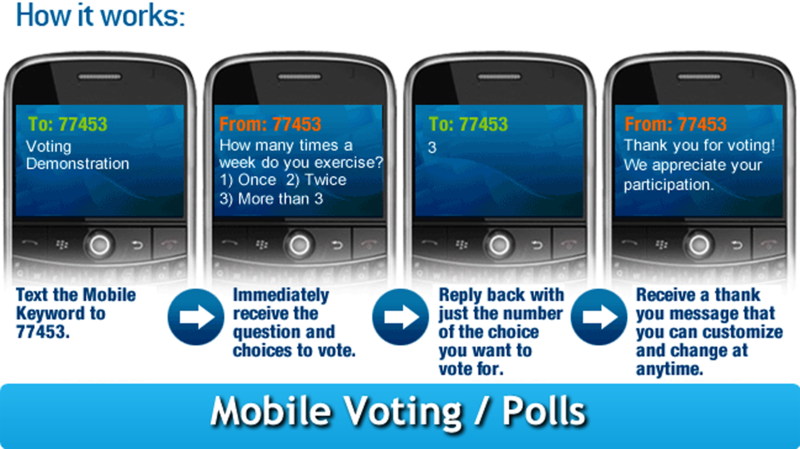 Clinical Contact records every vote / reply message and every mobile number in your account. You know who voted, what they voted for and this valuable insight allows you to tailor future messages to them via SMS. Keep in mind that each mobile phone can only vote once to keep the process fair and simple. A chiropractor who wants his patients to vote for the most important reason why they came seeking his/her services. Clinical Contact’s text messaging platform enables your audience to text your mobile keyword followed by a message so that it can be projected onto a large screen at your facility in real time. It’s the best way to keep your audience engaged and entertained! No more long, boring, one-way presentations. Create polls and quizzes to engage your audience, project answers on to a giant video screen, compel the crowd to participate, and then post the results on that same screen, ALL while collecting consumer data in real time! 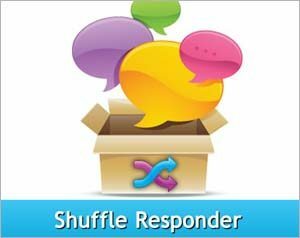 With the SMS shuffle responder your patients can text your keyword and get a different auto responder each time. It’s great for setting up a pool of different pre-planned promotional messages to send to your patients and prospects. 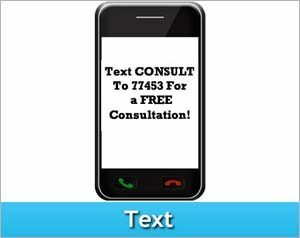 Create 10 different promotional text messages for your private practice. These will become a part of your automated shuffle responses when people text your mobile keyword to 70000. A physical therapy private practice signs up to use the automated shuffle responder to give fitness and injury prevention tips to patients/prospects. 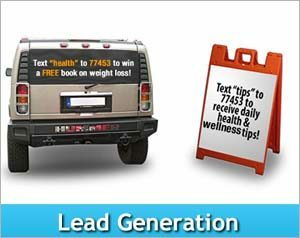 Banners and/or other signage direct patients/prospects to text “TIPS” to 70000 to receive their fitness tips. Patients/prospects can easily opt into the program by texting the keyword on banners and signs. Patients/prospects receive a special text message from the pool of different auto responders. When Patients/prospects text the same keyword again (“TIPS” to 70000), they will receive a different promotional message (the shuffle responder) until the pool of auto responses has been exhausted. Opting in is easy for the patient/prospect and it’s a fast way for businesses to obtain customers’ contact info. Patients/prospects opting into the program WANT to receive your specials and promotions. Once the promotions are set up, the private practice owner can quickly send out mass text messages to all the patients/prospects with the click of a button. This saves time and money. 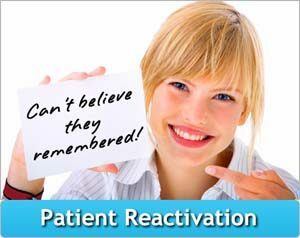 Increased engagement with patients leads to higher retention and improved patient satisfaction. Automate the timing of special promotions to go out during downtime and increase patient volume in a matter of hours (not days). Tie your mobile phone to your account so that when you’re not in front of a computer you can still send out a single text message from your phone to all your contacts. Text message personalization – looks like it was personally sent! Over 95% of SMS messages are opened as compared to 10-20% open rate for email. 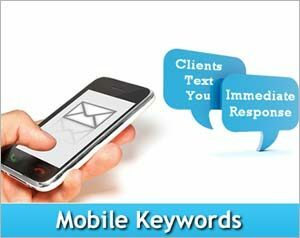 A mobile keyword is a one-word phrase that identifies your practice. The shorter it is, the better. For example, let’s say the name of your practice is ADAMS PHYSICAL THERAPY and you specialize in physical therapy of the hand. Your mobile keyword could be ADAMSPT / APT / ADAMHAND / HANDPT (upper or lower case does not matter). In American Idol, you text ‘fantasia’ to 70000. When a patient sends a text the mobile keyword ADAMSPT to a 5-digit short code number (which in the case of Clinical Contact is 70000), they receive an automatic text message (you specify the content) AND they get added to a list that you specify. This allows you to create different offers for different lists. For example, if a patient texts ADAMSPT to 70000, the patient will immediately receive an automated text response (that you can setup and change at anytime) with information about general physical therapy and get added to one list. Another patient texts ADAMHAND to 70000, the patient will immediately receive an automated text response (that you can setup and change at anytime) with information about hand physical therapy and get added to a different list. This allows you to create segmented lists and send personalized, relevant messages to your audience. You can setup a different automated response with each mobile keyword. Any Clinical Contact user can immediately create a mobile keyword as long as it’s not already taken by another user (much like owning an internet website name). For this reason, you want to secure your mobile keywords as quickly as possible, before your competitor does. Try it out yourself by texting PATIENT to 70000 and get a FREE book on the “10 Laws of Mobile Patient Marketing”. Please note that the keywords are not case-sensitive. After texting the keyword you’ll receive an automated response right back! Unlike traditional email subscriptions, mobile keyword subscriptions are controlled by the end users, your patients. People can subscribe and unsubscribe any time they want. The new emerging mobile culture makes mobile marketing (with keywords) an exciting new frontier with possibilities that exceed regular mail, email marketing and other traditional marketing channels resulting in an over 90% open rate (email averages are only 15-20%) and over 25% response rate. Short codes are special telephone numbers that are typically 4 to 6 digits long. Unlike regular 10-digit phone numbers, you cannot call a short code number. They are used for texting purposes only. Short codes act just like any other regular 10-digit phone numbers that you can send text messages to. Typically they are used by businesses, and are provided to consumers who may want to request more information about a product, service, or business. They are often used to tally votes for a contest or sweepstake (like they do in American Idol). You’ve seen mobile keyword and short code technology on TV shows, radio commercials, billboards, print advertising, and websites. 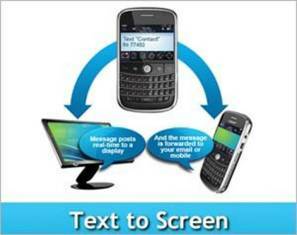 Send a text message to patients. When patients reply, you can see their text messages in your Clinical Contact account or on your mobile phone! This can be used for several purposes, including appointment confirmations. 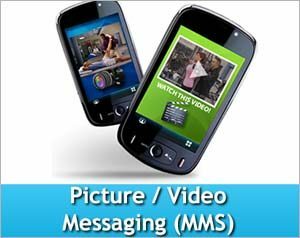 MMS (Multimedia Messaging Service) is an enhanced way to send text messages that include pictures and videos to the cell phones of your clients and patients. 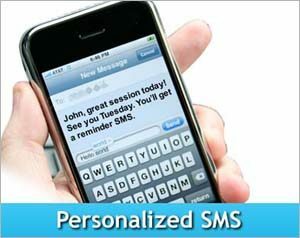 MMS takes SMS (text message) a step further by allowing exchange of text messages beyond the traditional 160 characters in length. With Clinical Contact, we allow you to send sounds, images and videos! MMS is the new standard in mobile messaging and often times gets 2 to 3 times the response rate in comparison to standard text messaging alone. With multimedia content, you can now deliver powerful messages faster to skyrocket your brand recognition, sales, promotions, and marketing. Unlike SMS marketing, Clinical Contact’s mobile marketing platform delivers animated images, a sound track, as well as audio ensuring your brand identity is immediately recognized by your clients and prospects. The Clinical Contact platform allows you to create text contests (also known as text to win), mobile contests and text sweepstakes. 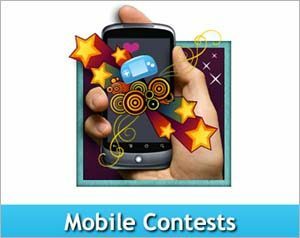 Your audience can participate in a contest and try to win a prize by sending a text message to70000. All information from the participants is automatically updated in your database for future contact. Text contests are preferred by consumers and typically result in more entries than the web, regular mail or phone campaigns. Clinical Contact allows you to create mobile contests to engage and entertain patients while capturing their contact information into your database. MMS creates a more interactive and emotional appeal on mobile devices compared to SMS through elements of sound, animation and images, giving you powerful visual branding possibilities. Keeps all your patients engaged through regular bulk MMS announcements with anything from coupons, promotions, important alerts to season’s greetings! Send MMS messages to specific target groups based on demographics, interests, or locations. Communicate with your target audience and get your message across right away. Send unique, customized MMS messages to individual people one at a time so it has the most impact. Make each recipient feel special! Help save the earth as part of a Go Green initiative with MMS. Sending moving colors and messages via mobile phones eliminates the need for paper and expensive direct mailers.